Born in Maroussi, in the region of Attica, he grew up in Tragano and Amaliada, in Ilia of Peloponnese, today’s Municipality of Ilida, the birthplace of the Olympic Games. He graduated from the 1st Lyceum of Amaliada. 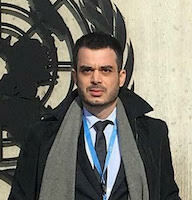 The President of the Hellenic Association of Political Scientists, Mr. Symeon Sidiropoulos, is a graduate of the Department of International and European Studies, Economics and Political Studies of the University of Macedonia with a specialization in Politics and Diplomacy. In 2009-2010 he attended the Queen Mary Comparative Policy Program in London. He obtained his master’s degree “Environment and Health” from the Department of Health Sciences of the National and Kapodistrian University of Athens. He is a PhD candidate in International Economics and Political Health at the University of Piraeus. He has completed e-learning education programs including: Conflict Analysis at the United States Institute of Peace and a Specialization Diploma in Education to Human Rights of the Dicastero della Pastorale Giovanile della Congregazione Salesiana. He is specialized in the Counseling of Public and Private Institutions. He is an Associate member of the International Academic Council on the United Nations System and Scientific Associate of the Laboratory of Health Economics and Management of the University of Pireaus. He has worked at the company “KANTOR Business Consultants A.E.”, and as a Consultant – Special Associate of the National Contact Point URBACT Greece – Cyprus. He has also worked as a Special Adviser of the Municipality of Ilida and as a Scientific Associate in the Hellenic Parliament, while until now he has been working with Members of the Hellenic Parliament at the level of Political Communication and Assistance in parliamentary work. He worked as a Researcher and Scientific Associate in research projects at the T.I. of Athens (2010-2011). He was the director of the electronic news site www.leksis.net. He has been a registered member of the Athens Chamber of Commerce and Industry (ACCI). He was a practitioner of the Greek Ministry of Foreign Affairs in the D1 General Directorate and the Office of the European Parliament. He has completed his military duties (2007-2008) with honorary distinction awarded by the Chief of General Staff of National Defense (SAE). In 2013, he successfully completed the Sea Land Border Security and Refugee / Arms / Dual Use Goods Control training of the MEPOTC (MPSOTC) Multinational Peace Support Training Center (UNHCR – NATO accredited center). He has been also active in the non – academic field, volunteering, for example, in the Olympic Games in Athens 2004. He is also a member of the Pontic Youth Association of Attica. In 2014, during the municipal elections of the Region of Western Greece, Mr. Sidiropoulos received more than 2,200 votes from the citizens of Ilida ranking 4th in the ballot paper. In 2008, Mr. Sidiropoulos founded the Scientific Association of Young Political Scientists, in which he served as a chair until 2015, elected in three successive electoral processes. In October 2015, during a special session of the Administrative Board of HAPSc Youth he was honored as an Honorary President of HAPSc Youth, for his services and his dedication. Since 2015, he is the President of the Hellenic Association of Political Scientists (HAPSc) and has been awarded with the highest title of the Association, that of Optimum Member.